Passion fruit (Passiflora edulis) is the edible fruit of a plant that is native to South America but which is widely grown in many tropical or sub-tropical areas. Other common names for passion fruit are Maracuya, Parcha (Spanish) and Maracuja (Portuguese). The passion fruit is round to oval, and either yellow or dark purple at maturity. It has a soft to firm, juicy interior filled with numerous seeds. The fruit can be grown to eat or for its juice, which has a strong exotic flavour and bright orange colour and is often added to other fruit juices to enhance the flavour. The fruits vary in size, but on average there are 25-35 fruits per kg. The bigger fruits (heavier than 30g) are more suitable for food processing as they have a higher percentage of juice to rind. The juice has a pH between 2.6 and 3.0 and an unusually high starch content. There are two important commercial varieties, purple passion fruit (Passiflora edulis), and yellow passion fruit (Passiflora edulis flavicarpa). The latter has larger fruits, more acidic juice and a less preferred flavour. The fruits are most suitable for processing when all greenness has disappeared and the outer skin has a smooth or slightly crinkled surface. The fresh whole fruit can only be stored for a few days at ambient temperature before it deteriorates. If the storage temperature is reduced to 6.5°C, they can be stored for 3‑4 weeks before any major deterioration. The pulp can be stored for long periods in bulk with 1000‑1500ppm of sulphur dioxide or benzoic acid or a mixture of both, but there is a reduction in the quality of the flavour. During heat preservation the main problem to overcome is the loss of the extremely heat sensitive flavour, which is susceptible to quick oxidation. The seeds are not suitable for stock feeding due to their very high crude fibre content. However, they can be refined and used in the manufacture of soap, paint, varnish and cooking oils. The skin of passion fruit is a good source of pectin, and makes a good manure. This technical brief should be read together with the brief on jams and marmalades, where there is an overview of the principles of jam making and a general introduction to quality assurance and control. In most countries, preservative cannot be added to the jam. Only a residue of preservative is allowed in jam which has been made from fruit pulp which has been stored with chemical preservatives (100ppm sulphur dioxide or 500ppm benzoic acid). Sodium bicarbonate is not a preservative. It is added to adjust the pH of the jam if the juice is too acidic. Jams give a gel when there is the correct ratio of pectin to water and the pH is between 2.5‑3.45pH. The optimum pH to give a good gel is pH 3.0. Therefore, sodium bicarbonate is generally added to passion fruit juice to decrease the acidity. Wash whole fruits in clean water and discard any bad fruits. Cut fruits in half with a stainless steel knife and scoop out the pulp with a stainless steel spoon. Stainless steel equipment is preferred for fruit as it does not stain the flesh and does not react with the acidity of the juice. If stainless steel is not available, make sure the knives and spoons are not rusted. Use a plastic spoon to scoop out the flesh. Extract the juice from the pulp by liquidising the pulp at a very low speed for about a minute. It is important to use a low speed to prevent the seeds from chipping. Chipped seeds appear as black specks in the jam. They are very difficult to remove and give the product a bad appearance. Tip the contents into a muslin cloth and squeeze out the juice leaving the seeds behind. This method will give a yield of raw juice from whole fruit of between 30 to 35%. Measure the amount of juice extracted and use this to calculate how much skin pulp is required. 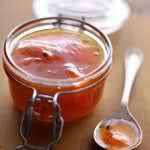 Skin pulp is added to the jam as it contains natural pectin and so saves adding artificial pectin which is expensive. To make skin pulp take the same quantity of skins, as skin pulp required. Boil the skins for approximately 30 minutes, until the flesh of the skin is soft and translucent. Then remove the skins from the water and scoop out the flesh from the outer cuticle. Liquidise this softened flesh with water (2 parts softened flesh to 1 part water) until it forms a smooth cream. Use the water in which the skins were boiled as this will contain pectin washed out during the boiling. Squeeze the mixture through a muslin cloth to remove hard pieces of pith. Mix the raw juice with sodium bicarbonate (NaHCO3) before boiling (if the NaHCO3 is added during boiling the jam will bubble-up over the top of the saucepan). Add the sugar and water and heat gently at first to ensure the sugar has dissolved. Then boil rapidly to evaporate the water and continue until the jam thickens. Keep stirring during boiling to make sure the jam does not stick to the base of the pan. Jam should not be boiled for more than 12‑15 minutes as this can give rise to caramel flavours, over sweetness and discolouration, apart from being a waste of energy. By reducing the amount of water in the starting recipe, the boiling time can be reduced. The aim of boiling is to reduce the water content of the mixture and concentrate the fruit and sugar in as short a time as possible. The final Total Soluble Solids (TSS) content of a jam (also known as the “Degrees Brix” or “end-point of the jam”) should be 65 to 68% (the TSS is a measure of the amount of material that is soluble in water. It is expressed as a percentage -a product with 100% soluble solids, has no water and one with 0% soluble solids is all water). The correct sugar content is critical for proper gel formation and for preservation of the jam or jelly. If the final TSS of jam is lower than 65-68% the shelf life will be reduced. The jam will have a runny consistency and bacteria and moulds will be able to grow in the product. If the TSS is higher than 68%, the jam will be very stiff and the sugar might start to form crystals in the jam. The end-point of boiling is measured in different ways. The most accurate method is to use a refractometer to measure the total sugar concentration. Remove the pan from the heat during testing as the jam will continue to cook and may become over-cooked. It is always possible to cook the jam a little bit more, but once it is over-cooked (and too thick) it cannot be reversed. Cool the sample before it is measured by smearing it on a cold dry plate or saucepan lid. All implements used to take the sample must be dry otherwise the reading will be reduced. It is important to stir the jam at all times during heating, otherwise it may burn at the bottom of the saucepan, causing off flavours and discoloration. This method is not really suitable for home-use as a refractometer costs about US$ 150. It is only when making jam for sale that a refractometer is necessary, to ensure consistency between different batches of the jam. When making jam for home consumption, other methods can be used to determine the end point: these include the drop test, the skin wrinkle test, or the use of a jam thermometer to test the temperature (68% sugar corresponds to a jam temperature of 105°C). When the jam starts to thicken, it is important to test for the end point at frequent intervals. Remember to remove the pan from the heat source while you test or it will continue to thicken and may burn. Wash and sterilise the glass jars and lids by placing in a pan of water and boiling for 10 minutes. Remove the jars from the water with a pair of tongs and stand upside down to drain. Do not dry with a towel as this could contaminate the jars. If glass jars are not available, use plastic jars. These cannot be sterilised with boiling water as they will melt. They should be thoroughly cleaned in warm soapy water and rinsed with a weak solution of sodium metabisulphite. Sterilising tablets (made of sodium metabisulphite) can be bought for this purpose. Allow the jam to cool slightly (to about 80°C for glass jars and 60°C for plastic jars) and then pour it into clean, sterilised jars. The jars should still be warm to prevent them from cracking when the hot jam is poured in. If the jam is cooled too much it will be difficult to pour. Place the clean lids on top and fasten. Invert the jars to form a seal. The filled jars can be placed in water to cool down the jam so that it does not keep cooking in the jar. The water should not be too cold or the glass may crack. Also, the water level must be kept below the lid of the jar. The gel starts to form as the temperature of the jam reduces (about 55°C) and continues until it is cold. The jars should not be moved or shaken while they are cooling or the gel will not form and the jam will not set. Jam that is hygienically prepared, boiled until it reaches the correct final total soluble solids (68%) and which is packaged in sterilised glass jars can be stored for up to a year so long as it is kept in a cool place away from direct sunlight. Jam that is packaged in plastic containers has a shorter shelf life – up to 4 months. This technical brief was updated by S. Azam Ali in March 2009. Dr. S Azam-Ali is a consultant in food processing and nutrition with over 15 years experience of working with small-scale processors in developing countries.